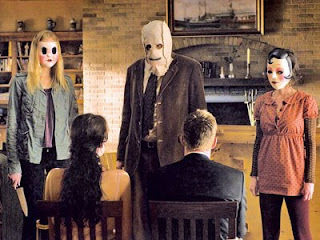 Cam's Cinematic Episodes: Film Review - THE STRANGERS: This Flick Let's It's Fright Flag Fly!!! 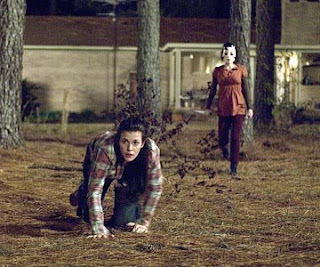 Film Review - THE STRANGERS: This Flick Let's It's Fright Flag Fly!!! The horror genre has been something of a laughing stock for the last few years. 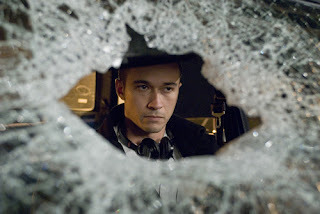 With only a small handful of genuinely effective films, including The Mist, 28 Weeks Later and the recent update of The Hills Have Eyes, the fright flag has mostly been carried by an endless parade of toned down scare-free remakes and morbid disgust-a-thons, such as the Saw and Hostel series. Well it’s nothing short of a perverse miracle that The Strangers, the latest attempt at separating the audience from their lunch, is a cringingly efficient throwback to the glory days of seventies horror. Starring Liv Tyler and Scott Speedman, and directed by newbie Bryan Bertino, The Strangers takes its cue f rom an assortment of classic genre staples, yet manages to make effective use of its barf bag full of clichés. The movie’s foreboding mood is immediately established when a rumbling death croak on the soundtrack informs us that the story we’re about to endure “is based on true events”. Now “true” is a relative term in horror-land, and indeed we can recall that the original Texas Chainsaw Massacre opened the exact same way back in 1974, but this simple bit of description is effective as it grounds the film in a recognizable, though eerie, reality. Also essential in immersing the audience in gloominess is the nicely naturalistic performances. Playing a couple in the middle of an em otional crisis, Tyler and Speedman never overact or reach for unnecessary high-notes. As the two mournfully wander, in near silence, around the world’s most under-lit farmhouse in the wee hours of the morning, their emotions are communicated to the audience through behaviour and body language, as opposed to clunky exposition. While they aren’t the cheeriest duo to hang out with, we feel close to them, and grow even more involved when a trio of masked lunatics, led by an individual that bears an unmistakable resemblance to Batman Begins’ sinister Scarecrow, descend upon them. Initially making their presence known through abrupt loud knocking and pounding sounds, it isn’t long before their game gets deadly and menacing hands start searching the woodshed and kitchen drawers for the necessary tools of the trade. What happens next is best left unsaid, although I will admit that it isn’t overly pleasant. Despite having never helmed a feature film before, Bertino shows a control over his material that is far beyond his years. Filtering his ghastly happenings through murky b rowns and straw yellows, he nicely recaptures the atmosphere of the great hillbilly horror films of the seventies, as well as John Carpenter’s original Halloween. He also shows a decent knack for staging shockingly effective scare moments that will jolt you from your seat. While I do find his over-reliance on shaky hand-held camera moves unnecessary, it’s a minor quibble. I have to admit that Bertino’s few shortcomings are gruesomely redeemed by one of the most effective and applause-worthy shotgun slayings I’ve ever witnessed... And sadly, I’ve seen more than my share. While a great deal of the credit for The Strangers’ fear-soaked environment falls at Bertino’s feet, the real unsung h ero of the film is the sound design team. Through an increasingly aggressive background of foreboding ambience, the team create a setting that drips with dread and white knuckle tension. As well, composing team tomandandy provide a nicely complimentary score which ratchets up the pressure at all the right moments. Amongst all the chaos, the presence of Liv Tyler stands tall. One of the more underrated actresses working today, she lets her soulful blue eyes do the heavy lifting. Chillingly alternating between distressed survivor and emotionally wounded innocent, she infuses her s omewhat thankless role with a level of sophistication and professionalism far removed from typical horror-film heroines. She’s our guiding force in the film, and her frightened performance makes the darker moments all the more potent. Scott Speedman, an actor infamous for projecting blandness, has finally found a film that makes good use of his vanilla delivery. His subdued emotions nicely match The Strangers' sombre opening developments, as well as the later unending terrors. He may not have much range, but he makes a good anchor for the material. Seeing The Strangers in a theatrical setting is a necessity if you are interested in enduring a film of this nature. The f ilm’s scare tactics are designed for state-of-the-art audio and picture quality, and a responsive audience will make all the difference. Bryan Bertino has crafted a nastily efficient little B-movie that deserves some attention. It left me feeling wrung out and tired, but appreciative of the skill involved. It also left me optimistic that, with less homage-driven material, Bertino may just have what it takes to become the next horror-film icon. Bloody good show, young man.